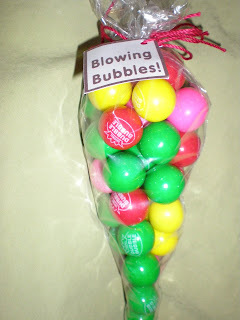 As I've mentioned, my Sweet Sister Swap partner Gigi is AMAZING! This is my second swap (though this swap was over the course of several months and in three parts) and both of my swappy buddies have been just incredible! I am a very lucky little crocodile!! 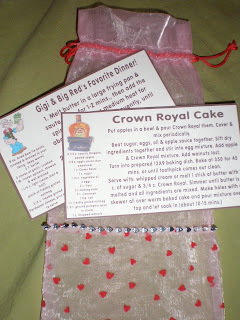 So here is the last part of my swap with Gigi. Just too much fun!! 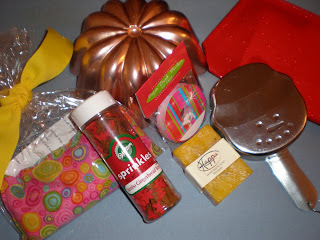 So I sent her this collection of goodies including a sparkley red zipper pouch with a few of my favorite and super easy recipes, wine glass name tags (thrifted), a copper mold (also thrifted. Look how good I am getting at thrifting, Cindy! 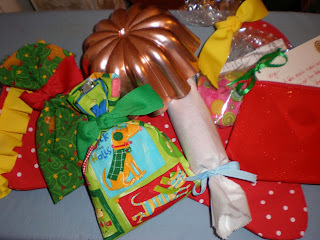 ), snowman measuring cups, gingerbread man sprinkles, fun soap from Hawaii, a corn toasty (made by me) and my favorite was the cute elf stocking. 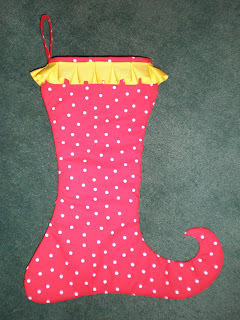 The stocking is red with white polka dots and yellow grosgrain ribbon ruffles on the outside and white quilted on the inside. And since we were about a month behind schedule for mailing our gifts (due to me being oot and my sewing machine quitting on me. Gigi was so sweet and patient! 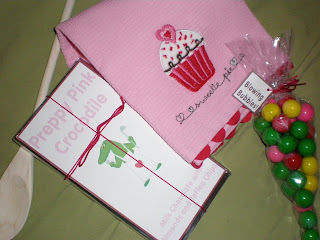 ), her last swap to me was more Valentine's themed. Soooo cute! She wraps everything with such beautiful detail. I am a wrapper- I think wrapping presents is the best part of giving presents. So I truly appreciate when someone goes over the top to wrap my presents. Almost too pretty to open. Almost. 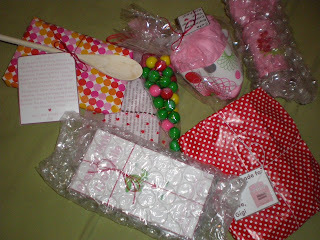 This adorable package included a cone shaped bag of gumballs, colorful measuring cups, a cute pink with hearts bag with some yummy recipes, a chocolate bar that she wrapped with her own label customized just for me, an always useful wooden spoon, a cupcake kitchen towel that matches perfectly with my Sadie Kate's new placemat (for under her food and water dishes in the kitchen), and then the two items that literally had me squeal out loud. 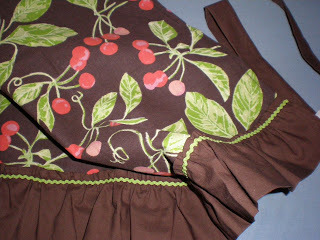 The first squeal came when I unwrapped the adorable brown with cherries apron. I believe she made this from a kitchen tea towel and I love LOVE LOVE it!! I love it!!! It is nice and wide and has both a ruffle and rick rack and I love it. I adore aprons and used them all the time. I put this on as soon as I opened it and put it back on when I was finished taking the picture. 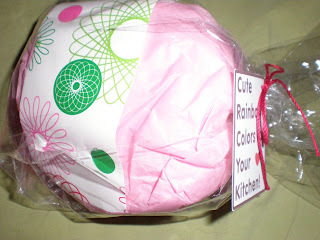 What a brilliant idea to turn a cute towel into an apron! Did I mention I love it? I do! 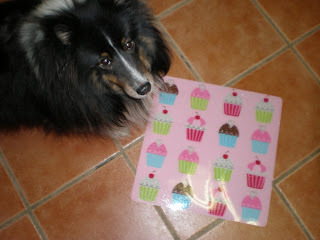 Then my second audible squeal came when I opened my last prezzie. 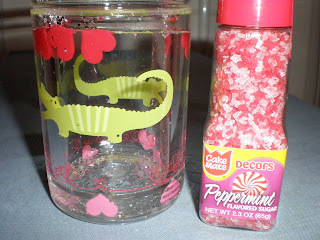 It's this little cup (that also included peppermint sprinkles). 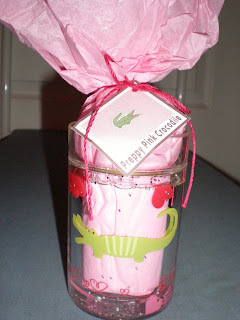 It is cute and little but it has crocodiles (or alligators depending on your blog name) and it is filled with water and sweethearts and glitter. 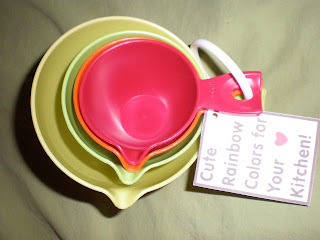 It's just so cute and fun! Sometimes it's the cute little things that make you smile the brightest in life! Thank you for an amazing swap Gigi! I look foreword to staying in touch and seeing all of your inspiring craftiness in the future! What cute things. How fun! Those are such cute gifts!